In this video series, a string with a hanging weight is attached to a cart via a pulley. When the cart is released, the weight drops, pulling the string, and pulling the cart to the right. 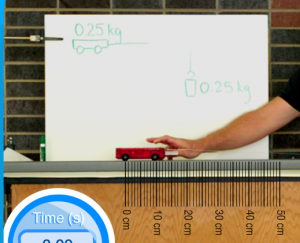 In videos #1-3, the amount of mass on the cart is varied, while the amount of weight hanging down over the pulley is kept constant. In videos #4-6, the total mass of the system is kept constant, but the amount of weight hanging down over the pulley is varied. All six videos were shot at 50 frames per second. The apps for these videos have a simplified interface without automated plotting or graphical analysis tools.